Zoho Projects allows users with Google Apps to assign tasks and create new projects from Gmail. And once you enable Google Task sync, tasks that you create in either Zoho Projects or Google Tasks will stay in sync with task name and descriptions. Feature Availability: All paid plans. 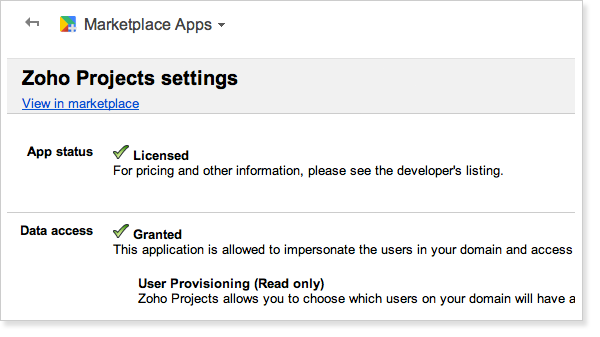 Before exporting tasks you need to grant access for Zoho Projects into your Google Apps domain. Login into your Gmail account and click Manage this domain link. Click Zoho Projects under Google Apps Marketplace section on the Dashboard. This redirects to Grant access privileges page. Click Grant data access link. This enables the required privileges for your Google Apps domain. You can export tasks from Zoho Projects into your Google Apps domain and stay connected. In the Home tab > My Tasks widget, click View More in the upper-right corner and in the Plain view click Export to Google Tasks. 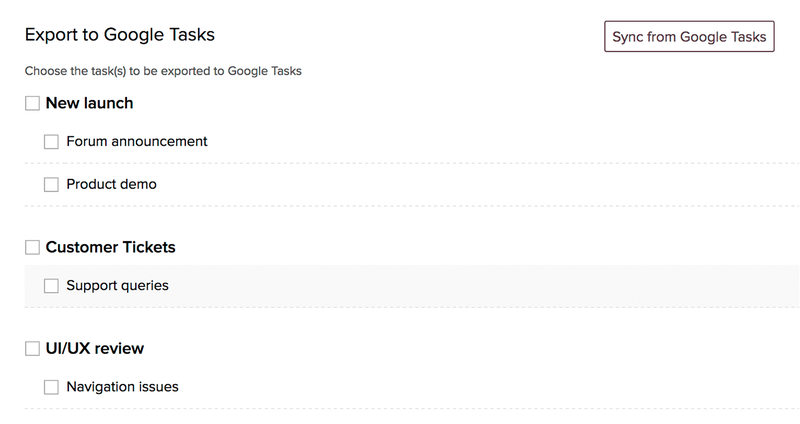 Select the desired task(s) or entire tasklist to export to your Google Tasks account. Click Export to export the selected tasks to Google Tasks. A message is flashed after your task is successfully exported to Google Tasks. 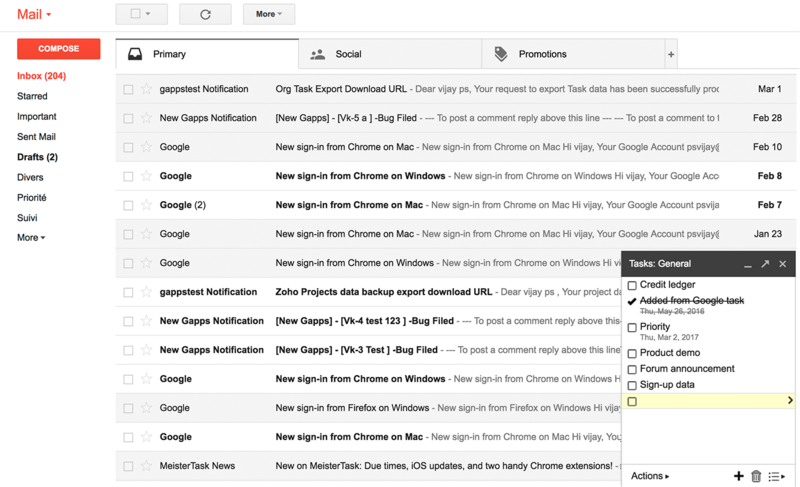 After exporting the tasks, you can modify the exported tasks in the Google Tasks popout window of your Gmail. You can sync all your edited tasks from Google Tasks into Zoho Projects to stay updated. You can sync new, modified, reopened and completed tasks from Google Tasks into Zoho Projects. Click Sync from Google Tasks to import the modified tasks from Google Tasks. Click Sync from Google Tasks to sync the modified tasks from Google Tasks into Zoho Projects.